For those of us blessed to have good access to education, many of us spend between 12 and 16+ years in school. When we think of our lives in terms of when we do the most learning we often think of those schooling years. While it’s true that from the ages of 5 through 18 our primary purpose and focus tends to be on learning, it’s quite fascinating to find out WHEN and HOW most of our learning in life actually occurs. And the more you know about WHEN and HOW learning in life occurs, the more intentional and effective you can be at successfully developing yourself. Learning scientists often divide learning into 2 categories: formal learning and informal learning. Formal learning occurs in a more traditional classroom context, while informal learning occurs in more spontaneous, unplanned or unstructured environments throughout a day. The human brain is constantly soaking in new information through our eyes, ears, smell, taste and touch – as well as through our spiritual senses. Everything that our senses experience is relayed to our brain for processing and storage. That constant flow of data to our brains serves to either reinforce knowledge and beliefs that we already possess or it creates new ideas, concepts, beliefs, and understandings of the world. The bottom line is that we, as humans, are constantly learning throughout the day, whether we realize it or not. Therefore, when trying to understand and maximize the potential of our own learning, we must consider what and how we learn in formal learning environments as well as in informal learning environments. Instead of only focusing on traditional learning methods (i.e. schools and universities), it is extremely helpful to look at the opportunities we have every day to informally, yet intentionally, learn from the world around us. According to research conducted by the LIFE Center, which exists to study human learning, between the ages of 5 and 18 the average American child spends 19% of their waking day learning in a formal learning environment (i.e at school). In contrast, those same school-aged kids spend a whopping 81% of their waking day learning in an informal environment. And as adults the percentage of time we spend learning in an informal environment increases to well over 90%! Take a moment and think about some of your achievements throughout life – both big and small. Perhaps you can start with how you learned to walk or talk, ride a bike, water ski, make a bed, be a good mom or dad, cook a meal, build something with a hammer and a nail, tie shoes, drive a boat, or use a smart phone. How many of those things did you learn through formal education versus through informal learning from others or on your own? The list of things we have all learned in life through an informal learning method is likely greater than we can imagine or count. As a matter of fact, research shows that nearly 70% of all learning that takes place at the workplace is via informal learning. But for some reason when most of us think of self development, we limit ourselves to thinking about formal learning options such as a school, university, seminar, workshop or certification program. Who could you talk to, email, call, or online chat with to learn more? What books or articles could you read? What special assignments or roles could you volunteer for that would give you opportunities to observe, learn and/or practice a new skill? What could you search on Google to learn more? Are there free YouTube channels or blogs or podcasts related to your focus area that you could watch or listen to? Do you know someone who is good at what you want to learn about and who could serve as a mentor to you? Would talking to a coach help you to set some concrete goals, determine how to move forward, and follow-up with your progress? Remember that life-long learning primarily happens OUTSIDE of the traditional classroom. Just because you don’t have easy access to formal education, or can’t afford it, or don’t have the time to devote full time to it, doesn’t mean that you can’t continue to develop your skills and abilities. In this amazing interconnected world that we live in, there are often many learning options available at your fingertips. It just may take some creative thinking on your part to identify them. Another consideration when looking at options of how to develop yourself is your learning style. Have you ever attended a training event where you were sure that some great information was taught but you just can’t remember any of it, let alone apply it? If so, there’s a good chance that the information was not taught in a way that utilized your preferred learning style. 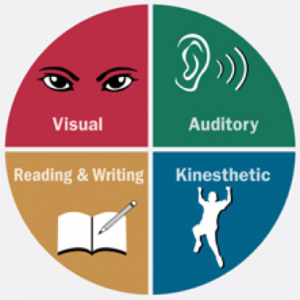 Good educators have been trained how to teach using a variety of learning styles. But you and I, as self-learners, also need to be aware of our preferred learning style and make sure we choose and design learning options that will allow us to learn in a way that is most effective for us personally. Auditory: auditory learners best learn new content through listening and speaking. This could occur in situations such as lectures, group discussions, and through speaking new information outloud repeatedly. Reading/Writing: people with a strong reading/writing preference learn best through words. They make take copious notes or they may be avid readers, and they are often able to translate abstract concepts into words and essays. Kinesthetic: kinesthetic learners best understand new information through tactile learning with their hands. For example they might like to learn how a clock works by taking a clock apart and putting it back together. Remember, when selecting an approach for how to accomplish one of your learning goals, think about which of your learning options best fits your learning style. It very well may make your learning experience more enjoyable, effective and rewarding. Whatever learning approach or approaches you end up choosing, keep in mind that the goal of learning is more than simply to gain new knowledge. The goal of learning should be to effectively use new knowledge, information, understanding and/or skills within the context of our everyday lives. Valuable learning is when new knowledge or skills are applied in a timely and appropriate way in real life. 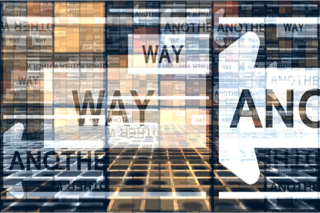 This requires what is called “knowledge transfer” – or the ability for us to apply new knowledge or skills into our own day-to-day life situations. Before we can transfer knowledge into our own context, we first must make sure that we remember and internalize what we just learned. The Learning Pyramid below is a helpful visual that describes the types of learning activities we can engage in to maximize the likelihood of us retaining and internalizing the things we learn. In the diagram above, you will notice that within 24 hours of listening to a lecture alone, the average person only has a 5% retention rate. That means that within a day most of us will forget 95% of what we hear in a lecture. Whoah! That’s not very effective learning, is it? The good news is that most good teachers or presenters do NOT merely talk. They often also provide slides or handouts with words on them to reinforce what they are teaching. According to the Learning Pyramid, by providing reading materials the average person will remember 10% of the material. That’s twice as good as a pure talking lecture alone. If you add visuals to that learning experience, the retention rate doubles again to 20%. If a demonstration of the teaching is provided (such as an example, case study, or supporting story) the average retention rates go up to 30%. Allowing people to discuss the new learning jumps retention rates to 50%. Giving people practice applying the learning to a real problem increases retention to an amazing 75%. And by challenging people to teach others what they have learned, the average retention rates go up to 90%. 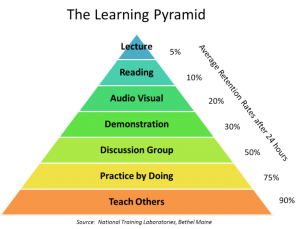 All of the methods of learning in the Learning Pyramid can be incorporated into a formal or informal learning environment. But it does take intentional effort to do so. Therefore, regardless of what formal or informal learning approaches you choose for your self-development goal, remember to shoot for maximizing your learning retention and your ability to transfer that new knowledge or skill into your everyday life. The more you engage in the learning activities at the bottom of the Learning Pyramid, the more likely you will succeed in truly achieving value-added learning and personal growth. On that note… take time right now to set a learning goal, decide what method(s) would be best for you to develop yourself, and then go and find someone to talk to and tell them what you learned from this article. Perhaps you’ll remember and apply 90% or more of it! **For more resources from the ALLC on Self-Development, click here.